As the first article of Spotfeed, we thought we'd give you something special. 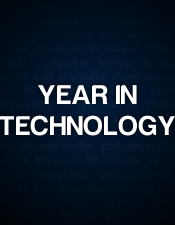 So, I present to you the Spotfeed Year in Technology, a compilation of overviews and analyses of major technological advances in the year 2010. These will be presented in parts and will be completed by the end of the week. 2010 has brought us even move advanced gaming by adding on to motion gaming. Two new platforms -- although moreover platform add-ons -- were released under the names of Xbox Kinect and Playstation Move. As for the Wii, released in 2006, it has been graced with many hit games in 2010, such as "Mario Galaxy 2", "Metroid: Other M", and "Red Steel 2." Four years later on September 17, 2010, the Playstation Move was released by Sony to compete with Nintendo's creation. Using the Playstation Eye, an orb on the PS Move's Controller can be sensed using actual image sensing technology as opposed the Wii's reliance on infared detection. Praised games include "Little Big Planet 2" and "Killzone 3." Finally, on November 4, 2010, Microsoft released the revolutionary Xbox Kinect which requires no controller at all. The system scans the area and based on changes in body movement determines controls. The system also features facial and voice recognition. Popular games include "Kinectimals" and "Dance Central". So, an opinion on 2010 Motion Gaming? Well, I'd say "They don good." 2010 has brought us the greatest phone advancements the world has ever seen. Let's take the two mainstream giants, Droid and Iphone 4, for example. The Android system for phones has been recognized the most in the phone, DROID by Motorola. The only software that can go toe to toe with the iPhone and perhaps even win. This article will be a comparison of the features that DROID and iPhone share and do not share. It is up to you, to decide which is the better system. -A market with over 100,000 applications. -The Android market is practically unscreened allowing apps with a greater desire. For example, Android had released browser applications to it's market before the iPhone and it allows pornagraphy applications, and useless apps. It does not control it's market which is considered a huge plus. For the people by the people. -Android OS is available to other companies and developers, allowing a wider variety of phones. -Integrated with Apple's iTunes, allowing for high quality music download right to your phone. -Apps undergo inspection, ensuring safety, reliability, and appropriateness. -Multitasking allows for running several apps at once! So which is the better system? Like I said, it's yours to decide. But we can answer a different question. Was 2010 a good year for phones? Certainly! 2010 brought us some great new toys; a lot of people favour the new tablets. There are four main (and many others) tablets, the Samsung Galaxy Tab, Blackberry Playbook (USA only right now), the HP Slate and of course the Apple Ipad. Unfortunately the Slate will not be included in this article because it is not in wide use. Galaxy Tab: Another great tablet here. The Galaxy has one great thing that the Ipad doesn’t a camera. It is also quite smaller than the Ipad at about 7 inches so it’s great for those space savers. The touch system is very smooth and crisp to the touch. The new experience of Google’s Android is refreshing which would be great for the people that haven’t experienced it before because it’s simple and quick. The Galaxy is also very durable but the back tend to slide back every once and I while so a case is recommended. Blackberry Playbook: A fairly new one to the market and as said above is only available in the USA currently. Research in Motion did great with this one. It gives you all the bells and whistles of a blackberry phone but in a bigger dosage. The 7 inch Playbook is good for something most other tablets aren’t, business! You can do everything with it! A downside is the screen is smaller than most and the camera is a little grainy. A huge upside is that it supports flash. This means you may play internet games if you wish. So which one should you pick? Well it depends on what you’re looking for. 2010 was kind to us with the upbringing of the tablets. Thanks for reading! That concludes The Spotfeed Year in Technology! New articles will be posted weekly from now on, along with tutorials and reviews. Thank you for choosing Spotfeed! Any questions, concerns, or corrections? Contact the author! Nice, hoping for more details on the next one But nice overview. I can here tell you that you wrote this because you bo wrote the They don good. Of course he"wrote this". Everything here is written by SF staff. It's also only part one. Thanks for the comments! The post has been updated with Part 2, written by Dennis and completed by myself. Part three would just have to be the development of Spotfeed. Part 3 is now up! Notice how mine's the biggest? Lesliehockey wrote: Notice how mine's the biggest? Haha Leslie. Nice job guys. Excellent in-depth article about Tablets. And like you said, I'm that person who likes putting movies on his iPad like crazy. Favorite Quote : The essence of water is wetness. I believe it is in the states, Flomar, but having said that, I only go by my research. You're right, it's releasing early April.